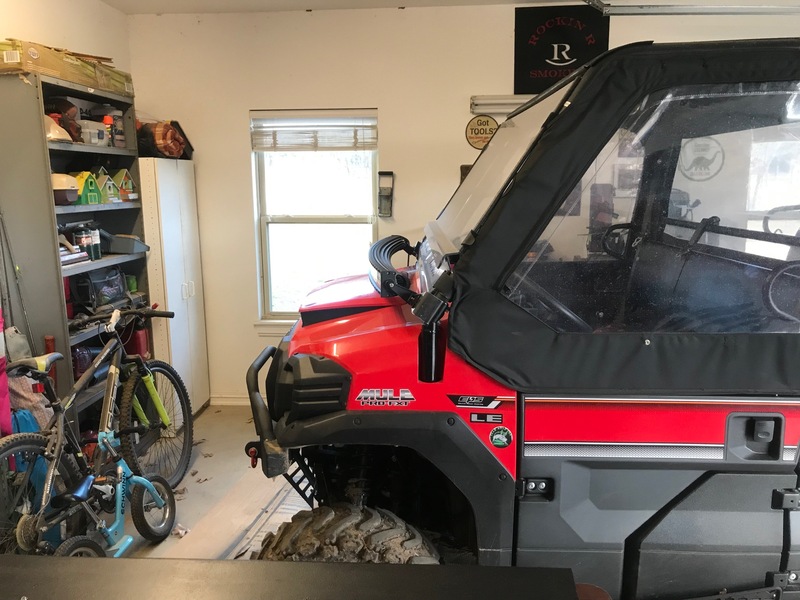 Kawasaki ATV Forum > Kawasaki ATV Performance / Maintenance / Technical > Kawasaki Mule > Mount light bar to factory plastic roof? 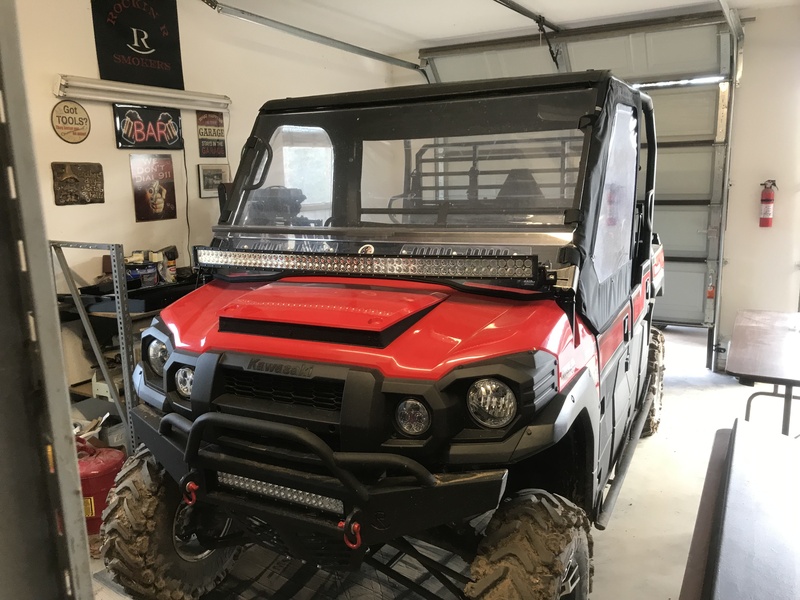 I want to put a full size light bar on my FTX, but I have the factory roof. It’s too flimsy in my opinion. Anybody do it? i'm upgrading my roof to a Ranch Armor steel roof for this very reason. I'm afraid a light bar would bounce around too much with the factory plastic roof. I wouldn’t. Why not on the front bumper? Light works much better at its highest/widest point. You can use a couple of pieces of 2" angle iron to mount it. Just run the angle iron to the front mounting mounting points of the roof. I just mounted this yesterday and it seems to be a very good spot. I had noticed guys with other makes of SXS using this as their preferred mounting spot. It puts out tons of light and will not get banged up by trees when riding on the trails. 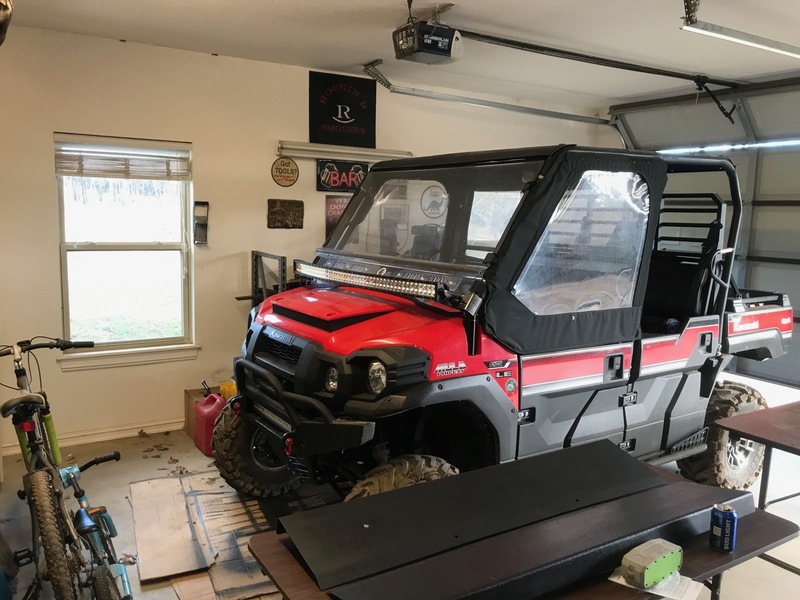 The wiring of the light bar and switch was the easiest yet. This is a 54" curved bar. RedDirtReed How does that hood vent thing work? Did it help with the interior heat issue that blows right on the drivers feet. This was the first thing I noticed right away after getting mine. What did you do with your wiring? Look at the post I did yesterday and tell me what you think. I was supposed there wasn't a fuse box added up front unless I haven't added enough off the normal wiring harness yet. The hood scoops work great- I may have a biased opinion though because of the fact that I build and sell them. They mix cool air coming in through the front with the hot air that is being pushed through the radiator. Without it all the hot air that is being pushed through the radiator is coming in under the dash into the cabin. I ride wearing shorts with no heat on my feet and ankles. As for the wiring, I expected that I would be putting many accessories on my mule so I ran a fuse block first thing. This way I only had to run back to the battery with one set of wires. I installed a 12 fuse Blu-Sea fuse panel under the hood and a disconnect at the battery. I ran rocker switches for all my accessories. They are hot all the time but only illuminate with key on so not to run the battery down while setting.